I once lettered a saying for my wife to hang at work that said, “There is a storm before the calm.” She found it a useful reminder when office problems were brewing, as they always do. Of course, some people are never calm even when winds are still. When the winds blast, others need that storm to actually stop before they can settle down. Yet, some are at peace while the storm rages. Such is the case of the disciples and their rabbi. While the disciples are frantic in the tempest, Jesus is napping. The disciples wake him, not so much to ask him to do something about the storm, but to criticize him because his calmness agitates them further. He rebukes them first: “Why are you so afraid? 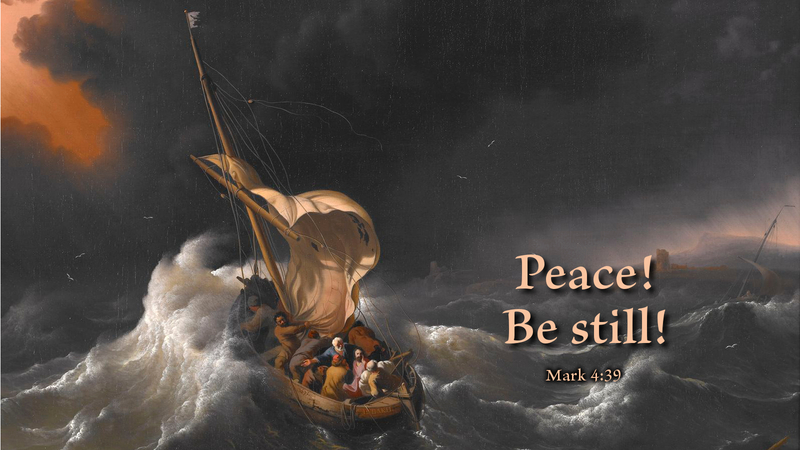 Have you still no faith?” Then he rebukes the storm and there is peace on the sea. They were amazed at his command of the elements. Prayer: Lord Jesus, help me to rest in you despite the storms around me. Amen.